Students of Government College of Girls in Sector 14, Gurgaon, protest the incident on Monday. 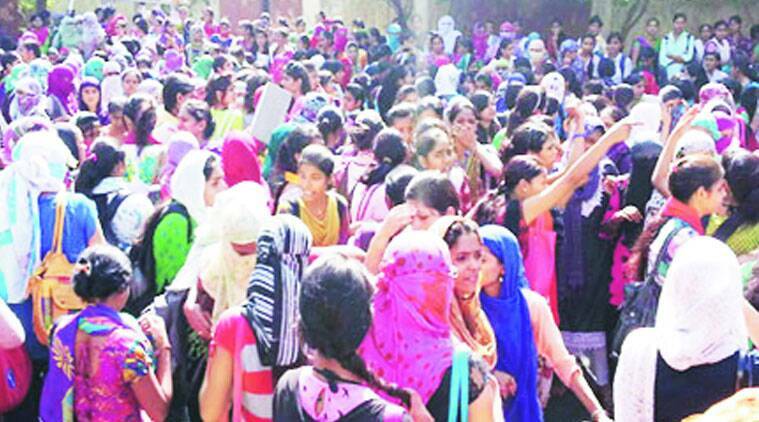 A 22-year-old girl set herself on fire on Monday at the Government College of Girls in Sector-14. Before the incident, the girl reportedly had an argument with the principal, police said. The BSc student, Pinky Chauhan, suffered 70 per cent burns. She has been admitted to Safdarjung Hospital in the national capital, police said. The college principal, Usha Malik, was transferred after the incident. “What happened was extremely unfortunate. We request everyone to maintain peace and calm. The Gurgaon police are taking all steps to maintain law and order,” Alok Mittal, Commissioner of Police (Gurgaon), said. Police said Pinky immolated herself in the parking lot of the college. A number of students, who witnessed the incident, claimed the girl was left unattended for a long time. One student also suffered burns while trying to save Pinky. Just before the incident, police said Pinky along with other students had met Usha, seeking her assurance that the college would look into why hundreds of students had failed in the recently held semester exam. She reportedly had an argument with the principal over the issue. “We protested on Sunday in front of the college. The principal assured that a group of 50 students would be taken to Maharshi Dayanand University and the results verified. But today, nothing happened,” Smriti, a BSc second-year student, said. “I had no information about the issue or the semester or paper the students are opposing. As far as zero marks in exams are concerned, students often fill up 20-40 sheets in the exams, but do not write relevant answers. We will look into the matter and resolve it,” B S Sindhu, Controller of Examination at Maharshi Dayanand University, said. Usha was transferred to Bhiwani and a new principal brought in on Monday. “We will try to sort out the issue immediately. However, the students will have to state their problems in writing. The students will be shown answercopies before any decision is taken. I will talk to all students,” Gianender Singh, the new principal, said.